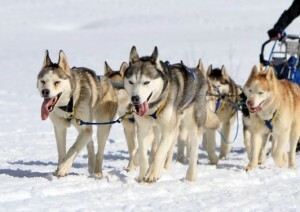 Interested in mushing with your Siberian Husky puppy? Whether that be the traditional sled-pulling, or some urban alternatives such as rollerblading, scootering, or pulling a cart, the training principles are the same. However you just can’t get your nine week old pup to start pulling you along! You need to build up the skills and strength. Here is how to get started. First you need to get your Husky outdoors and accustomed to foreign surrounds. Basic harness training is essential – which you can read about in Harness and Leash Training for Siberian Husky Puppies. You need to have control over your puppy to go and stop on command, as well as move in a straight line forward. You can start teaching some more commands at around 5 months of age. By this time we hope your puppy is growing in size, is used to being walked, and respects you as its master. By 9 to 12 months you can do short runs of less than a mile, and build up from there. You don’t want to put too much strain on a young dog while he or she is still growing and building bone structure and muscle mass. Just like humans we go through growth spurts in our youth, but it isn’t until early adulthood until we start to build significant strength and endurance. Line Out – which means pull the line taught. Used when you are about to start moving forward from a stationary position. At first your Husky will not understand these commands. A lot of repetition will be required, combined with positive feedback when the correct behavior is made, to get the command to stick. Like any training this will take time and patience, so use our training tips and feedback tips to help the process. Generally you should avoid having your puppy pull any weight, or drag, while it is still learning these commands. Trying to teach too many new behaviors at once is confusing to the puppy, and probably frustrating to the teacher as well. Once you think your dog is getting the hang of things you can try pulling some very light loads. Some good examples are a water bottle, an old bag or pair of shoes, or anything else that is unlikely to hurt the dog if he or she suddenly stops and the object continues in motion towards them. Over the next year you can slowly build up to heavier weights. It is really important to keep an eye on your Husky and look for signs of exhaustion such as sweating, excessive panting, over heating, or simply not enjoying the activity. Training takes time and dogs learn at different rates. Seppala Kennels has a fantastic, in-depth article on sled dog training. This covers much more detail especially with respect to equipment you might need. You should look around your area for dog clubs. 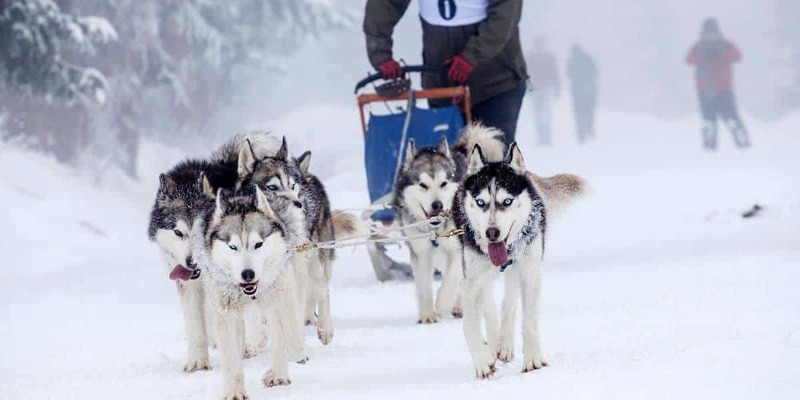 Not just Siberian Husky dog clubs but also sledding clubs, or just general clubs where you can hook up with others who can show you the ropes (literally speaking!). The book Mush! Revised: A Beginner’s Manual of Sled Dog Training by Charlene LaBelle covers the basics and although you may have no desire to get in to competition sledding, the topics discussed are still relevant to basic urban training. Whether you have high hopes of winning the Iditarod, or simply want to give your Husky puppy the opportunity to have a go at what is was bred to do, we hope these beginner’s tips have been helpful to getting you and your dog on your way.